This is the old Saint Mary's Female [or Girl's] Orphan Asylum, located in the north Saint Louis neighborhood of Walnut Park East at 5341 Emerson Avenue. Dating from about 1909, it is now owned by the San Francisco Christian Assembly and remains a charitable institution. 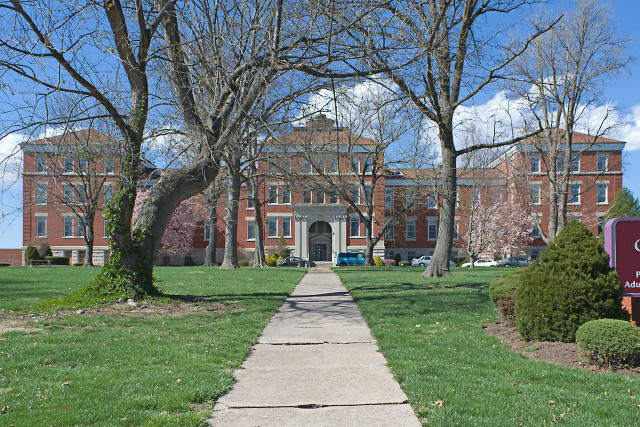 Adjacent to this property is a campus of the Confluence Academy charter school, formerly the Cardinal Ritter Preparatory School, which has since relocated to near Saint Louis University. This asylum, which is in charge of the Sisters of Charity, was founded in 1843, Mrs. Biddle, daughter of John Mullanphy, donating a site and $3,000 toward the erection of a home, giving at the same time the use of her own dwelling as a temporary asylum. In January, 1845, the building on Tenth and Biddle Streets was completed, and was occupied by St. Mary's Girls' Orphan Asylum for about fifty years, and until the recent removal of St. Joseph's Boys' Orphan Asylum to their new location, when St. Mary's Asylum was removed to the building vacated by the Boys' Asylum, at Fourteenth Street and Clark Avenue. In May, 1899, Archbishop Kain, president of the board of "managers of the Roman Catholic orphan asylums of St. Louis," received a gift of grounds for a new location in the northern part of the city, with means for the immediate erection of a suitable new building. St. Mary's Asylum maintains and educates orphan or homeless girls from the age of four to fourteen years. Two hundred and fifty girls are sheltered and instructed in common branches of education and vocal music, besides which they are taught to sew, cook, wash and bear a part in all the duties of the household. Children are given for adoption when suitable homes are provided; others are returned to their relatives when the necessity for assistance is over; those remaining in the asylum are, at the age of twelve or fourteen, either put out to service or transferred to St. Philomena's Industrial School, where they are taught dressmaking and other trades. The financial affairs of the asylum are conducted by the board of managers, consisting, besides the regular officers, of ten members, five clergymen, and five laymen. The internal government and management of the house is under the direction of twelve Sisters of Charity. Providing care for orphans was important in Plato's philosophy and Jewish law, and from the beginning was a primary concern for the Church. In the United States, the mobility of the population, a fluid economy, and the concentration of people in large cities both broke down traditional families and communities and ensured the rapid spread of epidemics. This led to many children without family or home, and so the creation of orphanages. Orphanages are rare in the United States today largely thanks to a scandal exposed in 1950. The operator of an orphanage in Memphis, Tennessee, with the cooperation of the government, would forcibly take children from poor mothers, and would then effectively sell the children to wealthy couples. Despite the elimination of orphanages, the practice of selling desirable children to the wealthy still exists. A society cannot be virtuous unless its individual members are virtuous, and no system, civil law, or revolution can correct that. Mark, I am always dissappointed to read that a former Catholic facility is in the hands of a protestant group or converted to an office building. I wonder however if the St Louis Archdiocese has actually suffered a decline or if so many parishioners have just been part of the suburban flight and that Rome of the West is just more spread out. I realize that some of those people are likely in different neighboring Dioceses like Belleville. Do you have any numbers or sense that the "Church" collectively is stronger or weaker in the entire region??? I think that it is partially suburban flight and a partial reordering of society. CBC initially was in the city, then moved to Clayton and is now at 270 and 40. Cor Jesu used to be in the city as well. When I went to St. Elizabeth Academy, there was pressure to move the school from the city to the county somewhere. I always found that funny because when the school was founded, it's current location was the country!